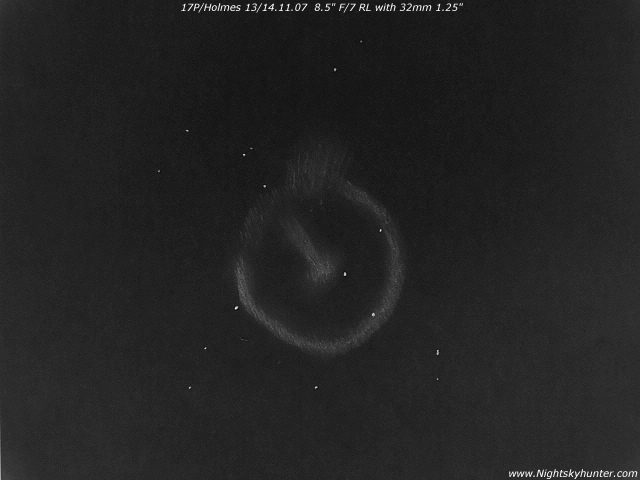 Sketch of 17P/ Holmes on Nov 13/14th 2007 at 21.50 UT using the 8.5" F/7 reflector with 32mm 1.25" eyepiece. The sky was completely cloudy but I set the scope up anyway more in optimism than anything else. A small gap opened in the high NE sky and I caught a 1 minute look at the comet. With the naked eye I was shocked by how much it has faded. It looked like a small green patch with no condensation very close to mag +1.9 Alpha. My guestimate for the coma was mag +3.5. In the scope it was incredible with a large elliptical inner coma shaped like a Whale's mouth with bright yellow-green trim around its perimeter with patches of bright and dark obscurations. There was a dark void inside with a hazy patch at centre with elongated dust fan pointing south where it sported a long tail. No false nucleus could be seen. To the SE was a fine line of delicate streamers arranged in a row which reminded me of a comb. The sky closed over again and I never seen the comet for the rest of the night. What a sight it was though with a inner coma in the 20' range!.